If you’re a medical or dental professional, the financial math of the Dentox injectables courses is very simple. Your return on investment (ROI) is not only simple to calculate, but you’ll see it more quickly than any other investment you can make today. The live, in-person group Dentox injectables training course takes place in one day. The one day in Los Angeles, New York, or Houston provides you with unequaled training in Botox, fillers and PRP (platelet-rich plasma) provided by the expert in the field, Dr. Howard Katz. On top of his world-class technical skills, Dr. Katz brings complete and accessible knowledge relating to the marketing and business side of the treatments. Equipped with your valuable new skill set, and a vile of product, you can begin to administer treatments to patients immediately. This turn over means you see your ROI, fast. The cost of the one-day live in-person training is $2500 and a vile of product is usually priced around 600 or less. For a total investment of $3100, you’ll see your new training pay for itself after as little as one treatment. A few years back, when the market wasn’t as strong as it is now, the profit from each vial of product was 1000$. It takes around 5 minutes to inject 100 units at the appropriate sites. Let’s be conservative; If you use just one vial per month over a 20-year career the math works out to 240 months X $1000 = $240,000. That’s the absolute minimum return on your original investment. This is just one area of growth. Though there is value in pursuing many different courses of study and adding to the breadth of your medical knowledge, this one area will account for the majority of your newly generated income. Also worth mentioning is the liability component. Certified Botox and filler procedures are incredibly safe. Implant providers are not only looking at a longer wait to see a return on investment (after purchasing machinery and training), but also need to worry about the associated complications. Don’t lightly make the decision to study the implants option. It’s a valuable skill, but adds to your psychological workload by adding the worry about the potential for pathologies involved in placement of implants. The ROI with Botox, filler and PRP training is beyond anything else available to medical professional today. The process is quite elegant in its simplicity and universal benefits. The marks of a competent medical professional are her up to date knowledge and her willingness always to learn. Aside from keeping up with the newest research, many doctors demonstrate their growth mindsets by regularly seeking out additional qualifications. There are a variety of training courses available to doctors in the US and abroad. So, how does one choose the next step for their career? For those interested in pursuing the next best growth opportunities, here are a few things you might consider. First, consider your priorities and the needs and desires of your patients. Do they align? And, would gaining certain knowledge and skill sets benefit them? One thing to consider is on what medical services are your patients spending their discretionary money. For example, are many of them seeking out aesthetic treatments elsewhere, that you could just as easily provide at your location? If so, you may find a nexus between the needs of your patients and a potential area for growing your practice. Within your current client base, you only need a small cohort of patients to give you a feel for what learning is of most benefit. If a subset of patients expresses an interest in or are already pursuing, Botox, dermal filler or PRP treatments elsewhere, then that service would be much more conveniently provided by you. As a business proposition, it is very logical. Aside from the convenience of it, your patients’ regularly scheduled visits and communications with your office are an ideal medium by which to inform them of the aesthetic treatments you also provide. If the need exists in the community you service, the cost / benefit analysis is a simple matter of looking at the cost of the training; usually in the range of $700 to $2500. The upper-end figure gets you live, in-person training in all relevant injectables in one day and online courses start at $700. Comparing the cost of the training to a fair market fee for treatments reveals how lucrative this type of growth can be. 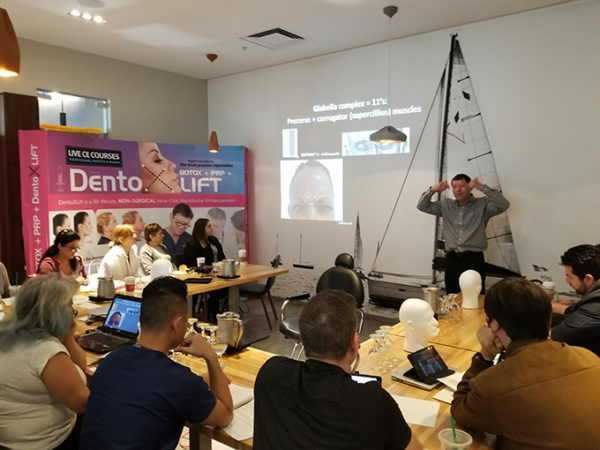 The Dentox training courses are considered the premiere continuing education option because they provide an all-in-one course taught by a respected leader in the field. Dr. Katz has over 30 years of experience working in medical aesthetics. 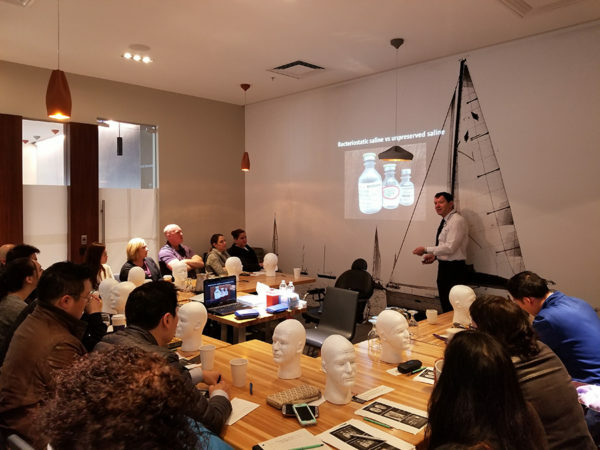 He’s travelled the world to speak as an authority on facial aesthetics, and he’s the originator of many patents (and his name appears on many others). The feedback for the courses received at the Dentox homepage and here on the blog is consistently positive. Participants highlight the extent of Dr. Katz’s expert knowledge, and practical teaching style (he’s a “guide on the side” and not a boring “sage on the stage”, one nurse reported). The praise for the skills in Botox, fillers and especially PRP are unanimous. 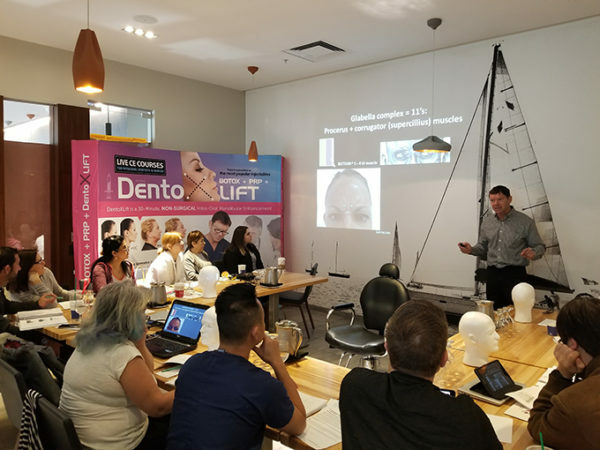 …If you determine, in consultation with your patients (and your pocketbook) that the next step in your professional learning might involve aesthetic treatments, consider learning with the best at Dentox. Our courses are not run by salespeople looking to sell you equipment, we’re lifelong learners, and we invite you to come learn with us. Ever-growing demand for facial aesthetic treatments has precipitated the continual growth of the industry and the variety of available Botox preparations for rejuvenating healthy skin. Of the many Botox preparations on the market today, Allergan Botox is a popular option. There are a few things medical professionals must be familiar with before being licensed to administer Allergan Botox. Here’s what you need to know. There are 43 distinct muscles in the human face. The small size of these muscles, plus the blood vessels and nerves woven through, make the face a very complex anatomical structure. Thus, undertaking any procedures with Botox requires a solid understanding of the intricacy of facial anatomy. Like all medical treatments, procedures with Allergan can carry certain risks. 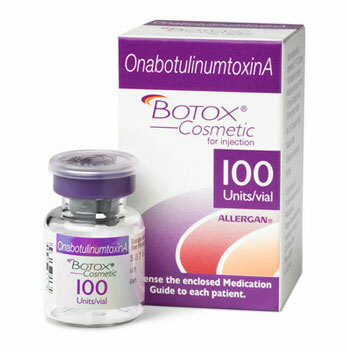 Foremost among risk factors are allergies to botulinum toxin or related products; if a patient reports such an allergy, Allergan Botox is not for them. There are also some muscle and nerve conditions which preclude the effective and safe injection of Botox. Though patients who report problems with breathing can receive Botox treatments, any issue with respiration requires that patients be monitored for a longer period after a procedure. Any good training course, like the ones on offer at Dentox, will go over contraindications in detail. Always ensure that patients are provided the opportunity to report any and all medical conditions as well as medications currently in use. Of particular importance, of course, is any history of surgery on the face; in which case, precautions and additional monitoring are prudent. Allergan is safe to use, but training courses will go over all confirmed (but rare) risks such as: issues with bladder control, problems swallowing, breathing and talking and generalized muscle weakness and vision distortions caused by the over-spreading of the Botox. Procedures involving the eye muscles can also cause bleeding behind the eye and have negative effects on the cornea. The identification and management of these potential and severe problems needs to be covered in-depth in any training course. The Dentox courses are good because they don’t only remind participants of the more commonly expected side-effects such as redness or swelling at injection sites. Allergan can be used to treat other conditions, such as: (1) muscle spasms (especially in the neck and hands), (2) Blepharospasm – uncontrolled blinking, (3) Urinary incontinence, (4) Hyperhidrosis, (5) Strabismus – lack of coordination of the eye muscles, and (6) Chronic migraines. A good training program will be led by a professional with current knowledge of effective applications of Botox. New uses of the product are discovered regularly through medical research, and each use necessitates a good understanding of the associated anatomy. Always inform yourself of the regulations and guidelines for Botox injections in your state. You need to know the necessary conditions for specific procedures, as well as who may legally administer Botox. These rules vary by state. The potential uses of Allergan are relatively broad (compared to other Botox products) and will require that medical professionals have an especially comprehensive knowledge of their state’s associated regulations. The term synergy is ubiquitous in the business world. The term can be misused and is definitely overused. Its overuse is due, however, to its validity as a concept in learning and business. 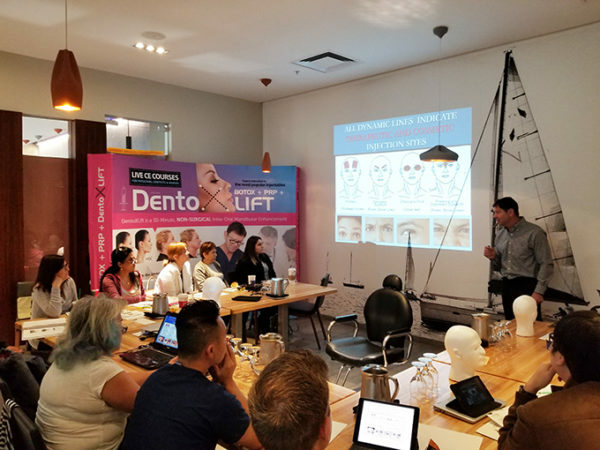 Because the learning at Dentox courses is larger than the sum of its parts, it’s truly a synergistic experience for participants. The feedback on our online courses, such as the Botox aesthetics courses, reveals something quite remarkable. Participants frequently comment positively on not just the content of the training course, but the interactions between participants and the course leader, Dr. Howard Katz. This type of feedback is amazing to read for any organization that intends to provide premium training for professionals. It means the course is worth even more than the sum of its quality subject matter. The course sets itself apart from its competitors. What exactly sets it apart? Dr. Howard Katz wrote the book on Botox. There is simply no one better equipped to educate medical professionals on the subject of Botox, fillers and especially PRP (platelet-rich plasma) treatments. He has been practising medical aesthetics for 35 years and educating groups across the globe. Dr. Katz has led groups in Germany, Holland, Spain, Saudi Arabia, South Africa, and has worked extensively in North America at prestigious institutions like NYU and NSU. He has collaborated with some of the biggest pharmaceutical companies like Allegan and Prollenium, is involved with the Facial Pain Association and is the president of the International Association of Dentofacial Aesthetics (IADA). Dr. Katz also holds five medical patents and is named on the patents for all injectable botulinum toxins used today. It’s simple; he is the authority on the subject matter. The feedback we receive reveals that Dr. Katz’s depth of knowledge and professional experience is not only of benefit in the explicit teaching of the course content. Many remark on the value of his asides. His offhand comments and anecdotes about the business of Botox are another unique feature adding to the synergistic experience of our courses. The techniques we teach are proven to accelerate the prosperity of medical practices. These modern techniques are also taught with a perfect balance of lecture and hands-on practice. But, beyond the excellence in teaching, the learning continues long after the course has ended. Participants can expect to receive Dr. Katz’s support (via email) after the course has been completed. Dr. Katz provides support usually within 24 hours of receiving questions about specific problems that come up in practice. All online courses are recorded so that participants can return to review any section of the session. These recordings are available anytime online. It’s these components of the courses we provide that set them apart and make them greater than the sum of their parts. Thank You To Our Students For A Great Live Patient Injectables Course! The Dentox injectables training course will be in Houston February 24th at the Four Points By Sheraton Houston Intercontinental Airport. The session begins at 8:00 am and wraps up at 5:30 pm. This course is intense, with extensive learning (sometimes taught over days in other courses) in one powerful day. On our website, you’ll find that among the many perks of participating in this training, you are encouraged to bring one staff member to participate for free. Your staff will perform two functions vital to the programming. (1) They will participate, thereby building capacity at your operation, but they are also there to (2) assist in demonstrating the procedures (where a treatment is deemed necessary it can be done on the spot). We believe that the practical (experiential) component of the program is essential. Thus, we have put together a workshop that honours this philosophy. There will be a lot of hands-on learning in the afternoon portion of the course. PRP is a treatment that involves utilizing the patient’s own blood to provide an injectable that fills lines and naturally increases the speed of healing. This treatment is what makes our training courses unique. No other program will offer PRP therapy training alongside Botox and Filler education. Our model is packed with valuable knowledge and skills that you can employ in growing your business and increasing its profitability. PRP is effective, but still novel. You might be the first provider in your area to offer the treatment! There are two strands running continuously during this training. First, there is the training in aesthetic medical knowledge (delivered by an expert in Dr. Howard Katz); and, second is the marketing side of things. Dr. Katz is equally an expert in the marketing and education relating to medical aesthetic therapies. While providing the training, he offers insights in how best to explain these treatments, ideas, and processes to patients. Even more importantly, he emphasizes key features of successful marketing in this area. Participants are added to Dentox online directory of certified practitioners. We could go on and on. The best advice myself and my team can give you is: sign up for this training, and learn for yourself why the course’s reputation precedes it as a purveyor of genuinely revenue-generating skills. We also encourage you to read more at the Dentox web page for the Houston training course, or on this blog. Best wishes in this new year, and see you in Houston! The next Dentox Botox / Fillers / PRP therapy training course is in New York City! The day starts at 8:00 am and ends at 5:30 pm and all workshops take place at 116 W 23rd Street. Of the many reasons to sign up for this January 13th event, here are just three we feel are most significant. This remarkable innovation is one of the reasons this training is unique. First employed by world renowned innovator, Dr. Howard Katz, PRP therapy is the process of using a formulation derived from the patient’s own blood to fill lines and speed healing. The applications of this protocol are many, from assisting the healing after dental surgery to clearing lines using a natural process. 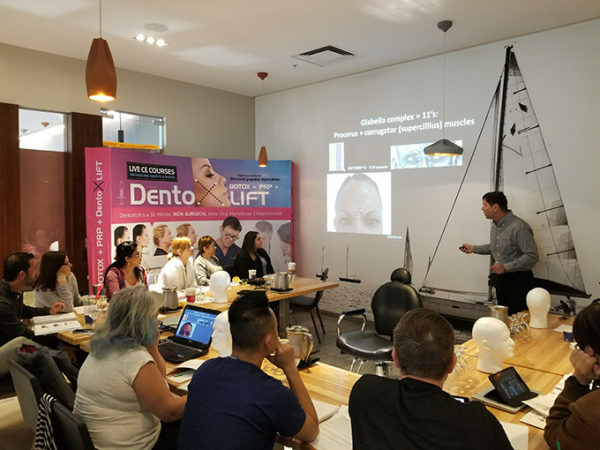 The Dentox injectables course is the only course that adds this learning to a fabulous line-up of already fabulous revenue-generating aesthetic procedures. With all of the learning, January 13th will be a very busy day, but well worth the time in terms of value. Attend this learning for the total number of lucrative skills delivered, including this one very important gem! Dr. Katz’s resume is too long to go into here. Click on this link and select “about Dr. Katz” to see an official summary of his accolades on the Dentox website. In delivering this course, what we kept in mind is that you need the course content delivered by an extremely experienced and knowledgeable professional. This is what you get with Dr. Katz at the front of the room. As the innovator of PRP therapy, there is simply no person better qualified to walk fellow professionals through the process from A to Z. Feedback we’ve received from participants speak of a competent doctor “who doesn’t just speak in front of us as a sage on the stage, but also beside us, as a guide on the side”. At Dentox, we couldn’t be more pleased to hear this kind of thing; we place a lot of value in providing a learning experience with a hands-on component. Thus, we are proud to have Dr. Howard Katz facilitating the learning on January 13th in NYC. As if the course content wasn’t enough, Dentox offers a series of extras in its training seminar. The training takes a very holistic approach to learning; that is to say, we look at the whole picture when educating fellow professionals about these skills and techniques. Not only is it important for entrepreneurs in the field of medical aesthetics to offer competently delivered services (and to be knowledgeable about them), but they also need to be competent educators and vendors of their services. 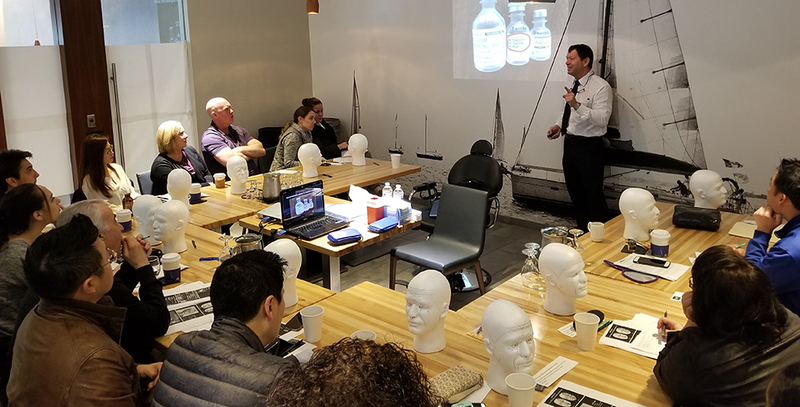 In the training course, Dr. Katz offers complete and accessible knowledge and strategies for marketing Botox / Fillers and PRP therapy in your local area and just talking to individual patients about the procedure. Also, bring a staff member to the training for free! They participate while also providing a demo patient for the practicum component of the course. There are many reasons we are proud to offer this unique training course. Our course facilitator, access to PRP training, and unmatched access to bonus content are among the top reasons. To learn about every other amazing aspect of this training, please have a look at the Dentox course page, or this blog. Injectables training in New York January 13 – Botox, PRP, Fillers and much more! This Dentox injectables course runs over just one day and includes workshops on Botox, fillers and platelet-rich plasma (PRP) therapy. No other one-day event offers as many training certifications as this one. The hands-on PRP therapy training is unique to this course, and is facilitated by its innovator, world famous Dr. Howard Katz. The Dentox injectables course is happening from 8:00 am to 5:30 pm on January 13th, at the business center on 116 W 23rd Street. Show up early to chat with fellow participants. With so many revenue-generating avenues opening up, you’ll likely have much to discuss and share. Here is the schedule for the training course as it appears on the New York City event page at Dentox. Click on the individual items to learn more about each topic. Each session is delivered to both instruct and practice the individual skills and techniques. For every section of instruction, there is a hands-on professionally facilitated practice component. This course is set up so you leave fully confident in your ability to provide the very best care to your patients. 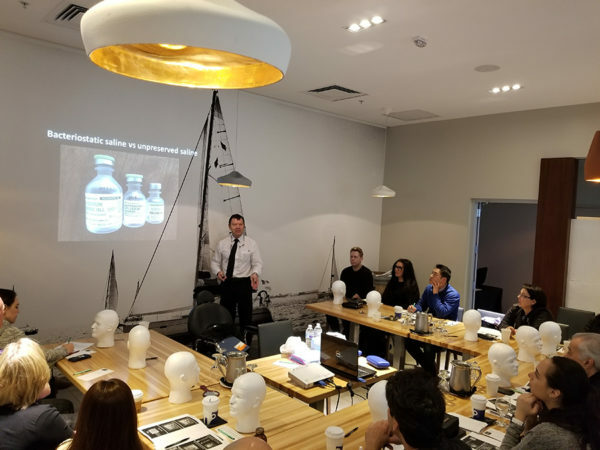 The material is ground-breaking and the instructor is a world-renowned expert in medical aesthetics with over thirty-five years of experience and a variety of patents relating to (but, not exclusively for) PRP therapy. Everything in this course is built on integrity; integrity in the people you’ll work with and in the learning process that honors all learning styles. The PRP therapy component is another feature that sets this training course apart from others. Platelet-rich plasma therapy is a new and very effective form of treatment for filling lines, regenerating bone and speeding up the natural healing process. In PRP therapy, the patient’s own blood is used to produce an injectable. You can learn much more on the Dentox blog. and all relevant forms for your patients. On top of these perks, your participation also means you get added to Dentox’s certified provider directory. You can, free of charge, bring one member of your staff to both participate in the learning and act as a patient stand-in for procedure demonstrations. The Dentox team is very proud to offer this unique opportunity. All details are provided on the Dentox web page for the NYC training. See you soon, New York City!